When the weather turns cold and rainy as the seasons change, we find ourselves reaching for warm, gooey comfort foods instead of the crisp cold meals of summer.  For many of us, this means foods like soups, stews, hot cereals, and, of course, big bowls of chili. Whether we like cheap canned chili, festive homemade vegan chili with fresh pumpkin, or small to-go bowls of chili purchased at fast food restaurants, we get the same satisfaction of a hearty, spicy, filling comfort food. We get all the warmth and texture of soup, plus the added benefit of satiating protein sources. Almost everyone is happy to receive a bowl of chili for dinner on a cold day, but what should we do if we are unable to finish off the entire bowl? Many of our leftovers make it into our pets’ food dishes, but, as our meals get more complex, determining whether or not they are safe for our pets gets trickier. Because chili is usually a meaty dish (and, let’s face it, it looks a little bit like canned cat food! ), it seems like it would be the perfect treat for our feline friends. But is it? Can you give your cat chili? The short answer is no, it is not a good idea to give your cat chili—even though your cat is a meat-munching carnivore, there are many ingredients in this popular winter dish that can cause serious health problems for your poor pet. Any small health benefits your pet may get from eating this protein-rich food will be negated by the problematic ingredients. Some of these ingredients can cause upset stomach and serious digestive problems, which can take days to resolve themselves, while other ingredients can actually poison your pet. If your cat has licked up a blob of chili off the kitchen floor, they will probably be okay, but if they have eaten a large portion of canned chili, it’s a good idea to keep a close eye on them for the next day or two. If they experience severe symptoms, or symptoms that last for more than a few hours, take them to the veterinarian as soon as possible. But aren’t meaty foods good for cats? It is true that cats are obligate carnivores; they tend to thrive on diets that are high in fresh, high-quality animal protein (meat!). While humans evolved to eat a wide range of foods, cats have bodies that are highly specialized—their bodies really only ‘know how’ to pull nutrition out of animal flesh, which is why cats eating even the most varied of vegetarian diets will develop nutritional deficiencies without proper supplementation. Chili does have the benefit of being quite high in protein—and, if it is not vegetarian chili, it has the right kind of protein, too. At first glance, protein-rich chili seems like the ideal treat food for your cat in the dead of winter. After all, it provides all of the amino acids your cat’s body needs in order to continue building and maintaining fur, nails, skin, and muscles. Unfortunately, all the stuff that makes chili so delicious also makes it dangerous for our cats. 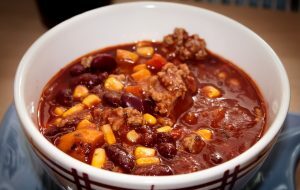 While the meat in chili may be an excellent source of protein, the other ingredients can cause serious health problems. 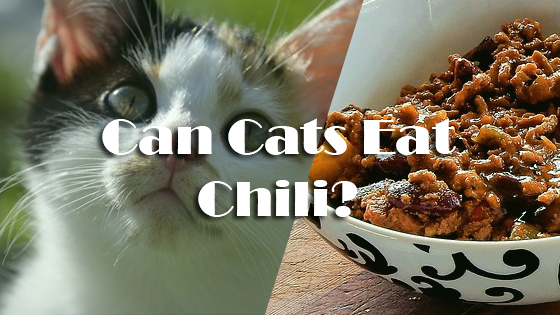 Chili almost always contains added sugar and salt, which are bad for cats. Sugar can be particularly nasty for our pets—our feline animal companions, who do not even have the ability to taste sweetness, did not evolve to process foods that are high in carbohydrates. The added sugar found in many types of chili can contribute to weight gain, tooth decay, upset stomach, insulin resistance, and type two diabetes. The spices in chili can put your cat in some serious digestive distress, too. Though we tend to love foods that make our mouths burn and our eyes water, our cats do not—the capsaicin that makes your tongue tingle will only cause your cat discomfort and anxiety. Even if your cat does not seem bothered by the spicy food in their mouth, they will definitely mind when it starts to work its way through their body. Spicy food tears up your cat’s stomach and intestines, and may result in diarrhea, vomiting, bloating, and other digestive problems. Because it can take a while for your cat’s gastrointestinal to repair itself after a run-in with spicy food, it’s best to avoid it altogether. The biggest reason to avoid chili, however, is that it may contain ingredients that are literally poisonous to cats. Almost all chili contains garlic and onions, which are extremely toxic to felines. Garlic and onions hurt your cat by damaging red blood cells, which hinders their ability to deliver oxygen to body cells. Over time, your cat’s body becomes starved of oxygen, resulting in anemia. Symptoms of garlic and onion poisoning in cats include vomiting, diarrhea, irritation of the mucus membranes in the mouth and nose, lethargy, severe abdominal pain, excessive drooling, rapid heartbeat, panting, muscle weakness, pale lips and gums, and collapse. It can take several days for these symptoms to set in, and, if left untreated, garlic and onion poisoning can lead to death. If your cat has eaten a large helping of chili that you know contains either of these ingredients, it may be wise to contact a veterinarian or a poison control center. Prevention is, after all, the best medicine. Finally, your cat does not need spicy food in order to enjoy what they are eating! They only have a fraction of the taste buds that you and I have, so their tastes are much less complex. A small portion of fresh, cooked chicken will excite them just as much as chili excites you, so there is no reason to put their health at risk for the sake of a treat. In conclusion, chili is not a safe food for cats to consume. Even though it is rich in protein, it contains several ingredients that can cause both mild and serious health problems, and it is best left off your cat’s plate. If your pet eats a portion of chili and shows any symptoms of garlic or onion poisoning, seek veterinary care. Can Cats Eat Cookies? Can Cats Eat Catnip?